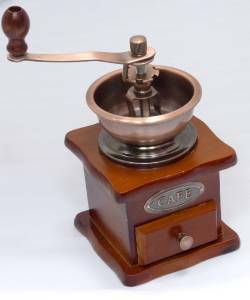 This is a Vintage Style Hand Coffee Grinder ideal for making freshly ground coffee. Now you can Enjoy making your own Fresh coffee. 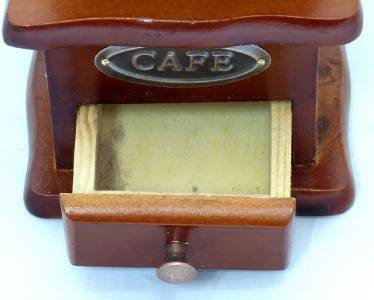 Perfect for coffee shop displays, as a birthday gift, or simply to grind coffee beans! Bronze colored bowl & crank. 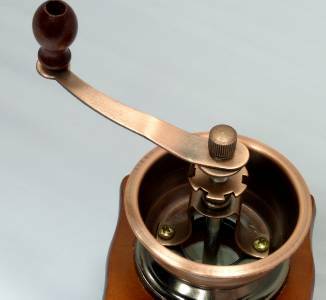 Before use should adjust the rubs bean machine: Grind coffee powder the minute thickness, center, thin three kinds. The user basis needs the degree, by adjusts the shaft upward or moves to under, upward is thick, under is thin. Moves to most under when should keep 0.25mm crack, avoids rubbing the stick to increase or to catch. When adjusts the proglottis adjustment to finish like the chart to install the screw on piece(2) and other fittings then works. Item will be shipped by airmail for small items, extra US$3.00, GBP2.00, EUR2,50 or AU$4.00 should be added for registered airmail. If you buy more than one items, combine shipping and handling service is provided. If you buy more than 1 items, we'll provide discount to you. Contact us for details. Actually, more items you buy, much money will be saved from the shipping & handling charges.